Blount County Palisades Park in the foothills of the Southern Appalachian Mountains offers two-miles of nature trails and a romantic covered bridge to take in the scenic views. Horton Mill Covered Bridge, built in 1894, just off Highway 75 at the foot of Sand Mountain makes it one of the highest in elevation in America. 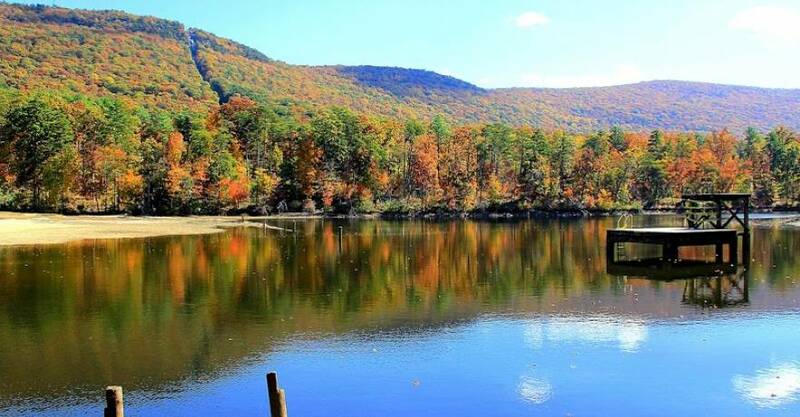 Ebell Mountain in Blount County Palisades Park is covered in dogwood, maple, and hickory trees that turn spectacular shades of orange, red, and yellow that seem to glow with fall color each year. Located in Northeast Alabama near Huntsville is Monte Sano State Park. Aside from the stunning mountaintop vistas, mineral springs, native azaleas growing throughout miles of biking and hiking trails, Monte Sano also boasts rustic campsites, RV camping, cabins to rent and a planetarium and observatory for stargazing. Another must do when you visit is to stop by the US Space and Rocket Center in Huntsville. Here you can explore the space museum, see rockets and shuttles that have made the trip to the moon, you can even be an astronaut for a day. Noccalula Falls in Noccalula Falls Park, a natural waterfall that cascades 90-feet over a rock ledge into Black Creek ravine below has a legend about tragic love. There once was a beautiful Native American princess named Noccalula. According to legend, she was to wed to a rich and powerful chieftain of another tribe. But Noccalula’s heart belonged to a young brave in her tribe. On her wedding day, Noccalula secretly leaves the wedding day celebrations. Silently, walking through the woods, her heart heavy with grief, she comes to the rock ledge. Watching the water pour over the edge of the precipice she takes one last step, ending her misery. Gorge Trail, one of eight hiking and biking trails for outdoor enthusiasts, meanders behind the waterfalls into a shallow cave. This is a stunning behind-the-scenes view for adventurous explorers. The waterfall flows off the ledge crashing on the rocks below. The park offers numerous amenities. Including 120 campsites ranging from primitive tent camping to RV pull-throughs with hookups, rental cabins, swimming pool, and laundry facilities. This makes Noccalula Falls an ideal glamping location to view the brilliant hues of fall color. Surrounded by stunning mountain vistas offering a bird’s eye view of Alabama’s fall splendor in Talladega National Forest, Cheaha State Park in Delta, Alabama has hotel lodging, restaurant, primitive campsites as well as RV pull-throughs, and rental cabins complete with a critical ingredient for a romantic weekend – fireplaces for chilly autumn nights. The 2,799-acre park holds several notable features. Such as Alabama’s highest point at 2,407 above sea level and Alabama’s first state park. If fossil hunting is your thing then 3,500-acre Desoto State Park should be on your list of fall places to visit. Located just 8-miles from Fort Payne, the park is home to the Lepidodendron tree, a petrified tree dating back to 299-million years. Due to its eagle-eye location on the top of Lookout Mountain, Desoto State Park has several seasonal waterfalls. These are best viewed in the spring, fall, and winter when water flow is higher. The most visited waterfall in the park is DeSoto Falls with a 107-foot cascading fall of water. Desoto State Park has several options when it comes to lodging. For Glampers they have two bedroom log cabins with full kitchens; single bedroom A-frame with a loft and full kitchen; in addition to 21 primitive campsites and 94 RV full hook-up sites. Alabama, home to forests filled with an expansive mix of birch, chestnut, hickory, maple, and oak trees that are true performers in displaying fall foliage. If you are on the hunt for a romantic and colorful fall getaway, Alabama should be on your mind. Thank you for reading. This travel nugget of knowledge about Alabama’s fall color may contain an affiliate link that does not affect you in any way but will allow Empty Nestopia to continue to bring you travel tidbits.